Air flow test have proven that cotton-gauze filters flow much more air than paper element filters do. However, when they get dirty, they can clog up and limit air flow. This is one reason why you should clean your air filter with Injen’s filter cleaner kit. 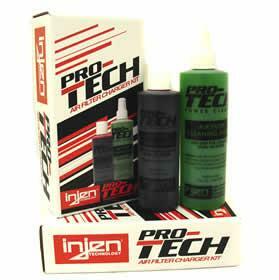 The kit contains Injen’s filter cleaner that loosens and removes dirt trapping capabilities. 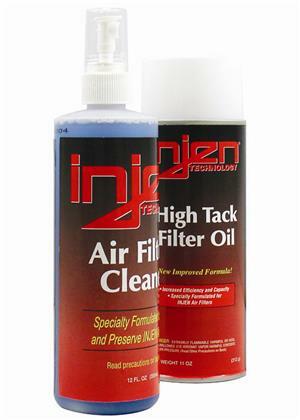 Injen’s filter oil contains a red dye to easily see where the oil has saturated into the filter, eliminating the common mistake of over oiling the filter. When used correctly, Injen’s filter cleaner kit can maintain the life and performance of your Injen high-flow filter and Cool Flow air intake system.